Dog is a social animal, but like his cousin wolf, can turn a loner if he doesn’t get attention he needs. Such dogs can pose potential threat, particularly to children, since they may turn out to be jealous and aggressive. This situation is simply avoided. Take care of your dog and give him the attention he needs. Play with your dog regularly. 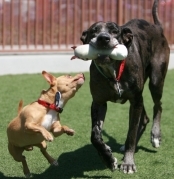 There are several games recommended by trainers, which will help build your dog’s character. We will hereby consider some of them. Start with simplified “go fetch” version of the game. Throw the ball, branch, etc and wait for your dog to fetch it. This game is good for introducing words such as “stay”, “go” and “wait”. Be patient. Throw the ball and tell your dog “stay”. If he disobeys, take the ball and ignore him for several moments. Then repeat the process. It won’t take long until your dog gets the point. Collect your dog’s toys and scatter them in a pile on the floor. Get a box where they’ll be stored. Tease the dog to bring you the toys, one by one. Give a food treat to the dog for each toy he brings. Put the toy in the box. Choose a toy which will represent tug rope. Always play tug with that toy. Encourage your dog to pick one end while you’re holding the other. Don’t forget to give a hint that the game is about to start. For example, you may say “let’s tug” or “let’s play”. Tug the toy a few times then tell the dog to drop it. 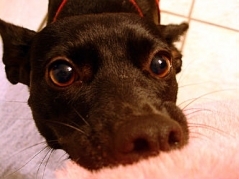 Since tugging is instinctive for dogs, your dog may be reluctant to obey. If that be the case, simply let go of the toy and walk away. If the dog drops his end, reward him with a food treat. 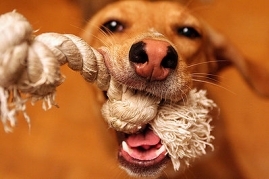 Some trainers argue that tug of war may provoke dominance problems in your dog. Others disagree, stating that dogs playing this game with their owners are more social than others. Whatever be the case, make sure you control the game. Always start it with a cue (“let’s tug”) and always drop the toy and walk away if he refuses. You start the game and you end it. Ignore dog’s attempts to take the leading role. Pick a toy of your choice. Tell your dog to sit. Make sure the dog sees the toy. Walk away and hide the toy. Start with easier tasks first (e.g. hide the toy beneath a couch). Walk back and send the dog to find it. Reward the dog with a food treat when he gets the toy. Gradually increase the difficulty. Hide the toy on less obvious spots. These are basic games every dog loves. Once the dog has learned that you’re the boss, you may invent new games to suit him. For example, you may wish to teach him to find car keys (advanced version of “clean up the toy”), help with hose (tug), etc. Practice advanced versions of the games your dog loves best. The happier the dog, the better you will feel.